I'm sure you've heard the phrase that if you ask a stupid question, you get a stupid answer. Conversely, if you want genius answers, you need to learn how to ask genius questions. This morning, I sat down with the Genius Symbols to ask a question I've asked a million times before and which gets me nowhere. I've asked the same question in dark moments, in moments of desperation, late at night, early in the morning, and the answers have always been the same. This morning, the Genius Symbols produced the self same answers again - and I was so disappointed. Disappointed and depressed. "Right," I thought grimly. "Not only can't I get what I want, now I can't even get a decent vision or revolutionary insight at the drop of a hat any more! Great!" I walked away and then reconsidered. The Genius Symbols are incredibly reliable. They have NEVER let me down. My own mind has NEVER let me down (unless I've doused it with so much alcohol that it materially extinguished the flame of intelligence for a short time!). What on Earth had gone wrong today? The original question I'd been asking for all this time IS THE WRONG QUESTION. This question will NEVER EVER produce anything useful - it's a stupid question. You ask a stupid question of the Genius Symbols - and you'll get 23 stupid answers. So I went back to the Genius Symbols, cleared the decks and asked this time, "What question SHOULD I be asking here?" I picked a single symbol which happened to be The Gift - and had near enough an enlightenment experience on the spot. "How can I make Silvia happy?" And NOW the symbols started to do their magic thing - not only did I get truly wonderful and inspiring answers on EVERY SINGLE SYMBOL, but there were also big connections becoming apparent between them, and lots and lots of additional information of where I was thinking the wrong things - and asking the wrong questions. Brilliant, perfect - and I emerged from the experience so much the wiser, it borders on the scary how different that was to the first attempt where I asked an old, STUPID question, and got the same old STUPID answers! 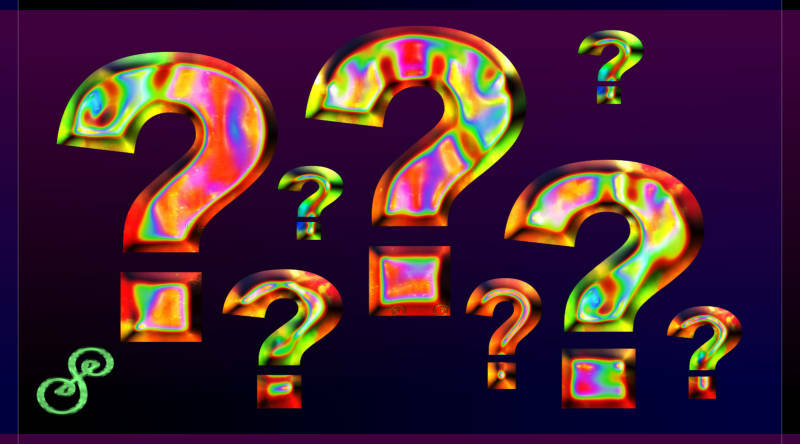 Questions are a very interesting thing, neurologically speaking, and to get control of the questions you ask also controls the answers you get. That works on many levels, and the Genius Symbols show that up perfectly in action. So what can you do to get to ask NEW questions that will INVARIABLY produce true genius answers to whatever problem you're struggling with? Well, I think the first step might be to get the questions you've been asking for AGES and never got any decent answers to out in the open and unmask them for the stupid questions that they are. Then we might ask, "Which question should I be asking instead here?" You can use the Genius Symbols to help you here - they can flash you information about the RIGHT questions, at the very least in which direction the information you need to finally solve these problems, these puzzles, can be found. In my case, I used a chunking up movement to discover the reason for asking the same old question in the first place. I'm not going to say what that question was, but it was on a par with such things as, "How can I earn more money?" I chunked it up to ask myself, "Why would you want to (earn more money)?" You can use that movement to get to bigger picture on all these old stupid questions that always produce the same old stupid answers, round and round in circles with no decent breakthrough into clarity and genius solutions in sight. "How can I get laid more often?" "How can I get more healthy?" "How can I sort out the attic?" What will that get you? WHY would you want to (insert whatever the old question was)? In my case, I clearly saw that it was just about me, being happier than I am today. I had hung it onto that thing, the stupid question, that only produced mundane and annoying answers all along, over and over again. Once I asked that other question, "How can I be more happy?" there was such an EXPLOSION of information, insight, and amazing ideas, real genius ideas, surprises (I love those the best!!!) it was brilliant. So do look at your questions. In a wider context, really STOP with the old stupid questions that produce the self same results that get you nowhere EVERY TIME you ask them yet again. Look at the questions and apply your intelligence or the Genius Symbols or both to try out some NEW questions - better questions, truer questions, more PROFOUND questions. You start asking these genius questions - and then you DO get genius answers! So how can YOU find your better questions to be asking of yourself, your Genius Symbol set, your daemon or whoever else you confer with in these matters? Well start with what I did. Write down all the questions you ALWAYS ask first. Tip: If you are stressed, aka low on the SUE Scale, you will always ask the same stupid questions like, "Why does nobody love me?" As this is a particularly stupid question to which there is not only no answer, but it will generate ENDLESS bizarre responses that never, ever run dry (aka "It's because I'm black! "), do know that you are just stressed and need to re-energize. Good questions require you to be at least at +5, perhaps even higher. With that said, write down the questions. Now imagine these had already been solved. What questions would you be asking next? That gets you a higher level of questions. You can continue asking for what the NEXT question would be, if that question had been entirely resolved, until you get to something more meaningful, something more powerful, something more EXCITING. You know you have a "the right question" (there are many!) if the question itself excites you enormously, to the point that you can't sit still any longer and have to run off to take some kind of action. Questions that do not INSPIRE you and raise your energy instantly (that's what in-spiration means!) are generally not worthy of your time and have to be the wrong questions by design.